I've tried to convert Visio documents (2010, 2013) to SVG for use with Inkscape 0.91 in two different ways, with unsatisfactory results. The trouble is always with the flowed text being incorrect in Inkscape. 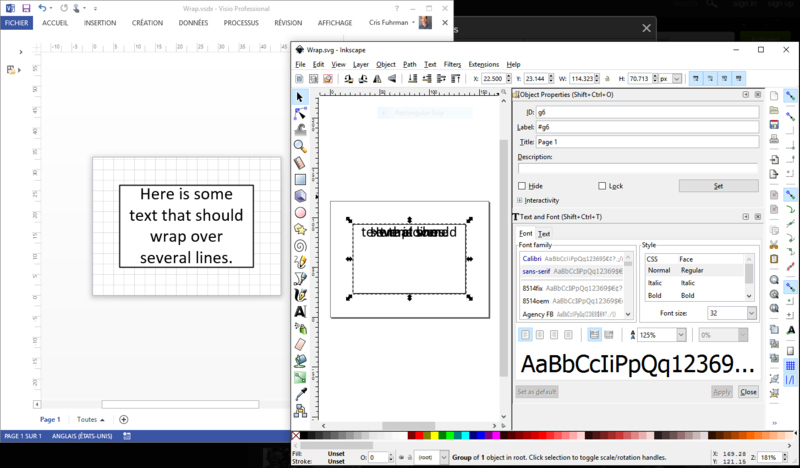 Opening the Visio (.vsdx) file with Inkscape Import. The text is not wrapped, and the rectangle is black (although the rectangle problem doesn't always happen in my diagrams). It almost looks like Inkscape is ignoring the dy portion of the tspan, but I don't know enough about that to say more. On Inkscape's Q&A forum I was told that SVG 1.1 doesn't support flowed text. Since practically all text in my Visio diagrams is flowed inside rectangles, is converting them to Inkscape/SVG therefore impossible until SVG supports flowed text? The main reason I want to use Inkscape/SVG is that it is also a free command-line tool to convert SVG files to other files formats (PDF, PNG, etc.). This is very useful in my LaTeX-based typesetting environment using LyX. I've been using Visio -> WMF/EMF as a partial workaround, because there's a converter to EPS in LyX. But it's also not perfect. Punctuation (commas, periods, apostrophes, etc.) in flowed text of the WMF/EMF is always positioned strangely, as if it's treated (kerned?) separately from the rest of the text. SVG seems to be a more modern and open standard, too. Browse other questions tagged inkscape svg text-wrap or ask your own question. How to convert normal text to flowed text in Inkscape?